Readers, since I started taking this blogging malarkey a bit more seriously and looking at my stats, I’ve realised that it’s actually my traybake recipes which are generating the most traffic on the site. It’s ages since I made a proper traybake and my favourite ones are those which involve a little experimentation! As you all know, I love chocolate. But if I had to pick, a Cadbury’s Crunchie would come out on top. It has to be my favourite everyday chocolate. 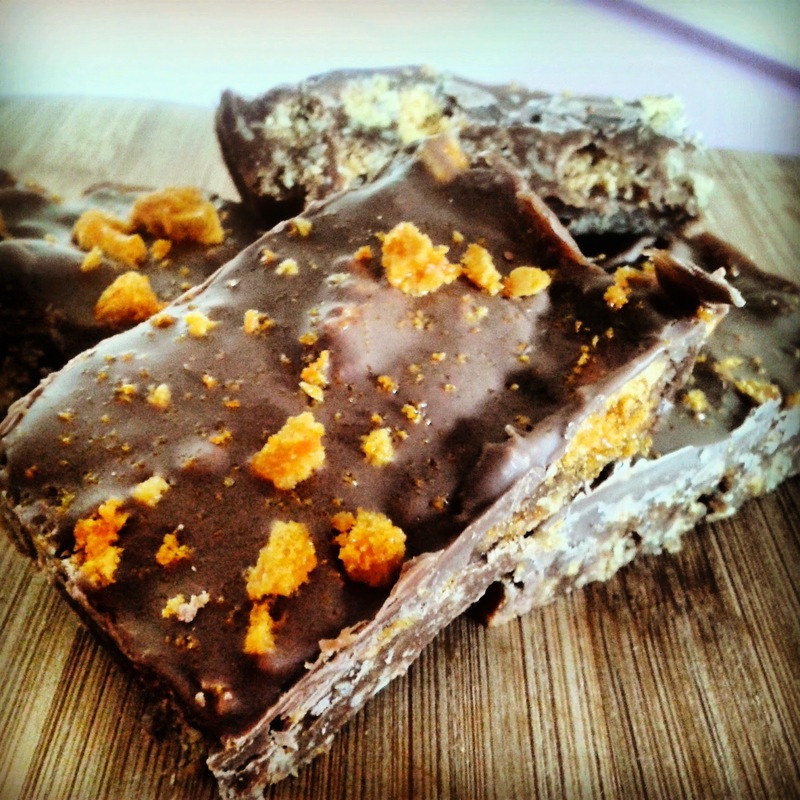 Whilst working on this recipe, I considered buying a load of Crunchies and smashing them up. 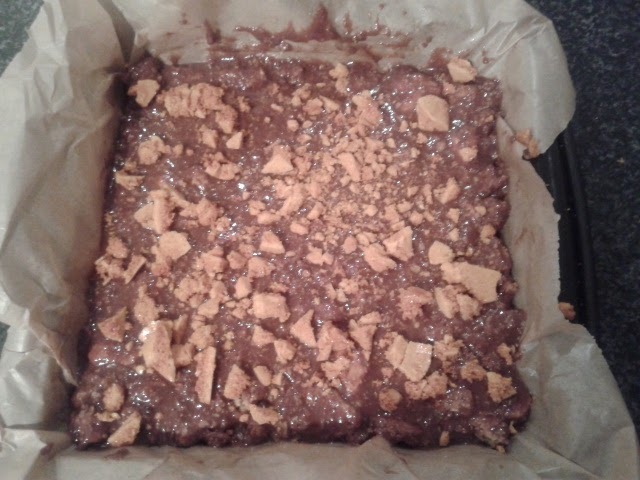 Instead, I challenged myself and made my own honeycomb from scratch, for the traybake. This is also a no-bake recipe – so it is easy to do with kids. 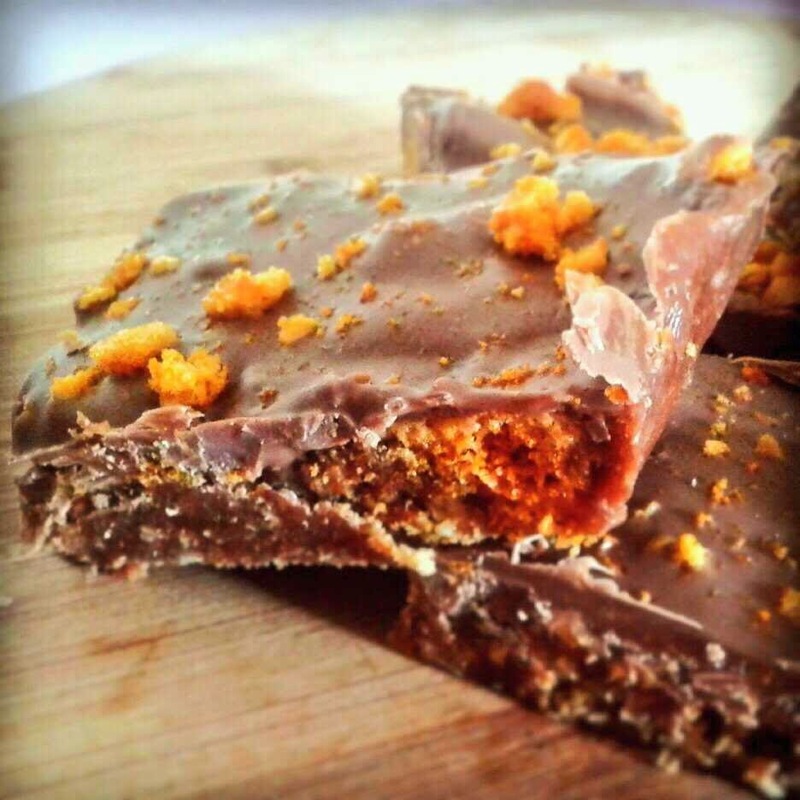 If you are pushed for time, you could buy some Crunchie bars, rather than making your own honeycomb. I also swapped the standard digestive biscuit base, for a humble McVities Hobnob base… A really good new dimension. Firstly, make your honeycomb. Grease a silicone bakeware 8in square tin with a little vegetable oil. 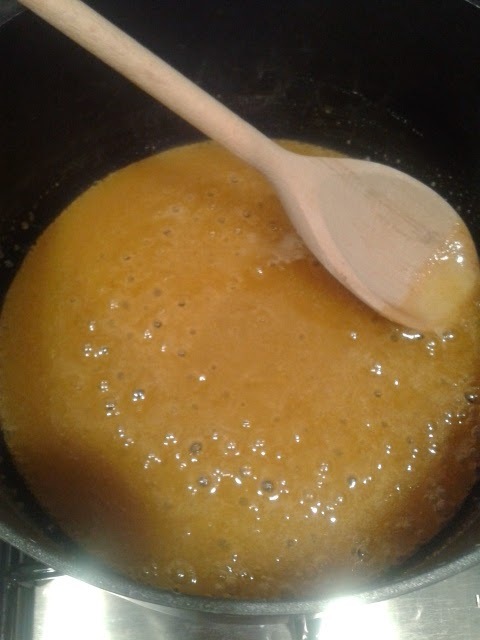 Add your caster sugar and golden syrup into a non stick pan and stir. Heat until the mix comes to the boil, then simmer over a low heat for around 5-6 minutes. Test to see if it’s ready by dropping a little of the mix into a cup of water. If the mix hardens quickly and is crunchy, not chewy, it’s ready. (Be careful not to burn it). 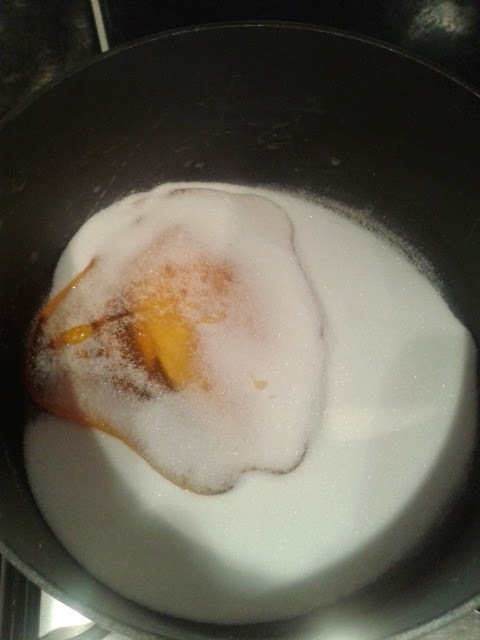 Remove pan from the heat and quickly whisk in the bicarbonate of soda until fully combined and the mix has frothed up. Then quickly pour the mix into your bakeware and allow to settle by itself. Don’t touch or it will flatten. Leave to cool and fully harden. (I find transferring to the fridge helps). Once cooled, smash up the honeycomb into small pieces, suitable for your traybake. Line a square 8in silicone bakeware tin with greaseproof paper. 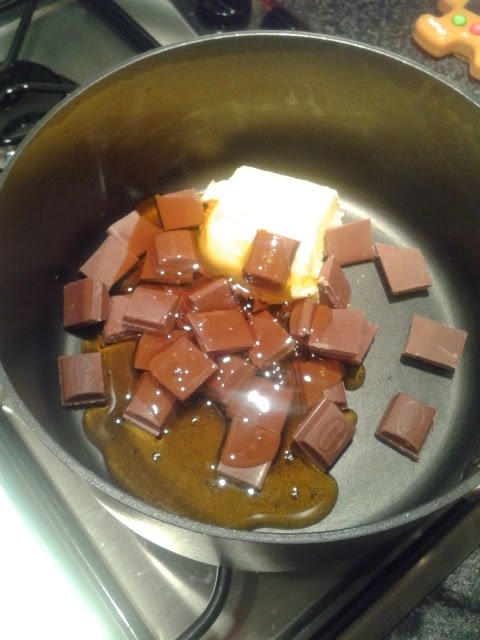 Add the butter, 150g chocolate and golden syrup to a medium non stick pan. Melt all the ingredients over a low heat until smooth and combined. Meanwhile, add the biscuits to a well sealed freezer bag and crush into small pieces, for your biscuit base. 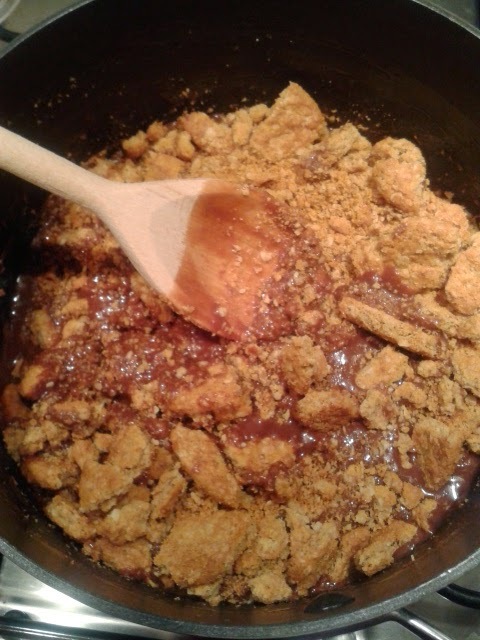 Once the chocolate mix is fully melted and combined, allow to cool, off the heat, for a couple of minutes, then, stir in the biscuits and mix until fully covered. Transfer the mix to your silicone bakeware and use a wooden spoon, flatten out and push out into the corners of the bakeware until you have a smooth base. Then, sprinkle around ¾ of the smashed honeycomb over the base and push down lightly so it sticks to the base, but isn't covered. Transfer to the fridge to set for around an hour. Put feet up and drink tea, in a chilled out fashion. When your hour is almost up, melt the remaining 100g of chocolate in a glass bowl, over a pan of barely simmering water. 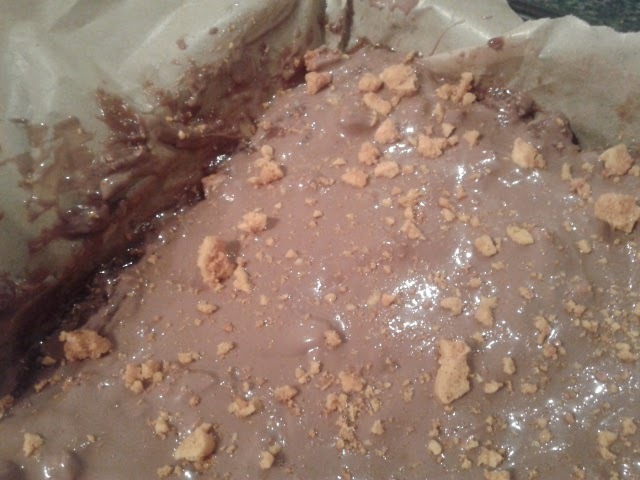 Remove the traybake from the fridge and pour over the melted chocolate. 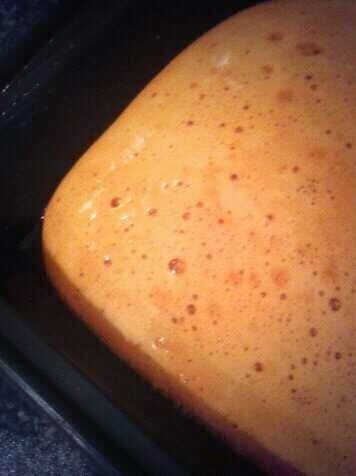 Then, sprinkle over the remaining small pieces of honeycomb and return to the fridge to fully set. 9. Cut into squares and serve. The traybake will keep for around 3-4 days in an airtight container in the fridge. Serve up with a lovely cup of tea! That wuld be way to tempting for me. I'd keep going back for another bite! I have to be honest - it didn't last long! I really like this recipe that O might trait out but reading through it I saw that you put Golden Syrup down twice in the same Part of the recipe. Hi Naomi, thanks for pointing this out to me. I've amended the recipe if you want to give this a go now. Good luck!